Get in there! Rami Malek has only gone and landed himself a Golden Globe nomination his portrayal of Freddie Mercury in biopic of the year Bohemian Rhapsody. The film, released in the UK on October 24, took £6.48m in its opening weekend, knocking Bradley Cooper and Lady Gaga’s A Star Is Born off the top spot at the box office. The reviews… weren’t so great overall, but Malek was widely praised. 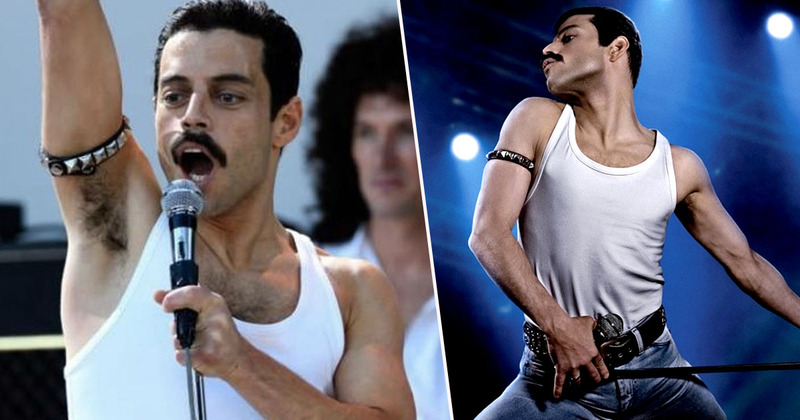 Still, Bohemian Rhapsody has been nominated for Best Motion Picture and its protagonist, played by Malek, has received a nom for Best Actor. He will go up against the likely likes of Bradley Cooper (A Star is Born), John David Washington (BlackkKlansman), Lucas Hedges (Boy Erased) and Willem Dafoe (At Eternity’s Gate). Yes, the film may not have been quite up to the critic’s scratch but it certainly went down well with the Hollywood Foreign Press, and those dearly close to the story of Bohemian Rhapsody. Par exemple, in a recent interview Malek revealed how Freddie’s sister, Kashmira Cooke, reacted to seeing him booted up as her late brother. I met his sister. She got to see me as a young Freddie with long hair and the teeth, make-up, the whole 1970s, early glam-rock look. As you can imagine it was an incredibly bizarre, alien moment for her. However, Kashmira was later moved to tears by the performance. Later on, it was a very emotional moment. On a serious note, she wrote me the most moving email. It was very powerful. To get that vote of appreciation from the people who were closest to him was everything for me. Kashmira wasn’t the only confidante of Freddie who Malek bowled over. Queen guitarist Brian May came out with some words of support last week. He’s incredible… without doubt he’ll be on the nominations list for an Oscar and well deserved as well. He inhabited Freddie to the point where we even started to think of him as Freddie. Really remarkable. We’ve lived with this project for nine years and it’s incredible to see it doing so well. It came out to s***ty reviews, as some of our work has before, but the public has embraced it magnificently. Everybody gave 200%, from the actors and technicians to the production team and hair and make up, everyone. You don’t get any lukewarm responses. The guy who plays me should be getting awards all over. Malek said himself of the role that he ‘instinctually [wanted] to discover more’ about Mercury as he prepared for the gig. There’s just an eloquence and elegance to him that you can see when he’s on stage and then you can see where all that was birthed from. I mean, not many artists are wearing an entire head-to-toe leather outfit, sipping a champagne flute and telling their audience to strip naked if they please. And he still comes off with this essence of royalty. Just earlier this year, Mercury was found to be the greatest singer of all time. Meanwhile Malek’s year on the big screen is far from over. He stars in Papillon, due out on December 21. From then on out, it’s all about award season baby! You can catch the Golden Globe Awards on January 6.